WW2 yellow B3 life preserver vest. This was used by the USAAF in WW2 by aircrew and was also issued to the American Airborne Divisions for the Normandy invasion. 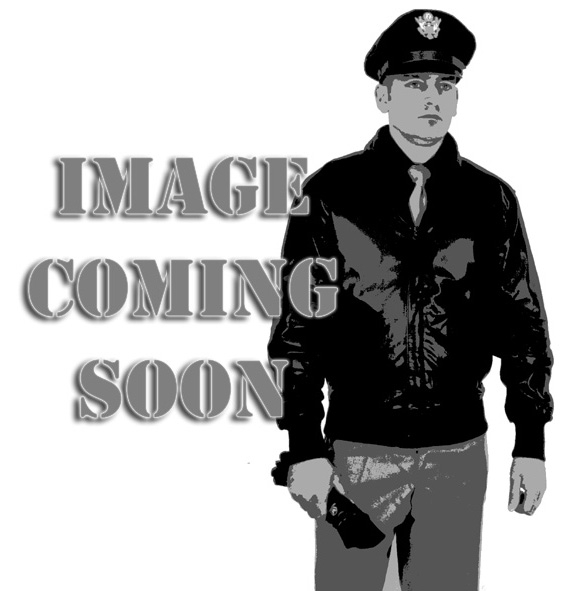 The "Vest, Life Preserver, Type B-3" was first issued in January 1936 to aircrew. It was used by the 82nd and the 101st Airborne on D-Day in case they landed in the sea or rivers. This is a very high quality replica made from rubber bladders with the correct yellow coloured cotton canvas outer and will give your Air Force or Normandy D-Day Airborne impression that finishing touch. 2 x C02 cartridges with pull cords at the bottom of the vest between the two layers of the vest. Leather front panel with inspection date stamped on it, this was to protect the life preserver from the parachute harness rubber against the vest. 2 x rubber mouth nozzle tubes with brass fixings design for manual inflation. Waist strap with correct style chrome buckles. Strap which goes between the legs on loops onto the waist belt. On the lower left corner it has the correct stamping with the item name and contract number. Please note the CO2 cartridges although they look correct they are dummies and do not have any gas inside and will not work. The vest cannot be used as a working life preserver it is only sold as a collectible or re-enactment/living history display as it cannot be inflated.